This is maybe my longest blogpost in history and I am sure I’m not going to compete with this one. There was just so much juicy information about a time in Ethiopian history which is not really discussed or talked about. This documents and briefing’s from the American Embassy and Reftels that was sent to the US is telling a story that is interesting today. I personally have much more knowledge about Meles Zenawi and post him, then the time before. It has been discussed in certain books that I have read on the political history on the Great Empire of Ethiopia. What often portrayed about this time is very blurry. With this stories that I have found on WikiLeaks, they might shine a light and give some of the other ones who read my blog some new insights to special time in Ethiopia. This is at the time of the rule of the Derg and the PMC Chairman Lt. Gen Haile-Mariam Mengistu! The DERG executed 62 civilians, military detainees and hostages. Some of this people is the once that are involved in the top officials who are supposed to topple the PMC. One of the men who is supposed to executed are General Aman former Chairman of PMC, Also Prime Minister Endalkachew Makonnen, the Emperor’s grandson Admiral Desta. The one not on the list is the former Emperor Haile Selassie (WikiLeaks, 1974). This happened because of an inner struggle for power between General Aman and Haile Miriam Mengistu, the last mention is the one that is suspected to inherit the title after General Aman. Amans strategy has been to collect his supporters and especially from his own area in Eritrea. Second part of it Pro-Monarchist has used Aman to stage a comeback. Third is too reduce the 120-man membership to 15 best educated junior officers, this to have a Junta especially made for General Aman. Fourth strategy is the disagreement over Eritrea. Where the PMC has stepped up the military actions and the PMC is not for a separate state as a solution and has sent reinforcement to secure the military situation. Fifth strategy for General Aman struggled because of his close ties to Haile Selassie. Haile Selassie is held at the Menilik Palace. Another press report is rumored that he will be executed (WikiLeaks, 1974). Who is Haile Miriam Mengistu? Was the official VC in the Provisional Military Commission (PMC), he is the chairman of the Armed Forces Coordinating Committee (AFCC). This has been in control since June in Ethiopia. HMM is an ordinance officer, a training officer of the 4th division in Addis Abeba (WikiLeaks, 1974). The thing that is fearful for the American views of what is happening in Ethiopia. Soviet is trying to supplies and arms to the country (WikiLeaks, 1974). This power struggle that happen on the 24th November happen a fight between Aman and the PMC. The foreign policy is still not certain. But first manifestation of this is the follow up on the Soviet offer of military equipment a few months ago (WikiLeaks, 1974). In a Land Reform seminar that was a two week this was opened at the National University (former Haile Selassie I University). There was 900 civilians, 400 military participants that was briefed by 28 expert lectures and 15 other military and civilian speakers. The experts and speakers spoke on topics of socialist programs and ‘administration of land and land reform’. PMAC Mengistu termed the participants “disciples of change”. Mengistu said that all of them carried the responsibility of building a greater Ethiopia. Minister of Land Reform Ato Zegeye Asfaw said: “Socialist Ethiopia will give land to the tiller and collective farms and communes will take care of the land and its utilization for the common good of the people” (WikiLeaks, 1975). Heavy fighting has occurred in Asmara at the 18th. The attacks we’re concentrated on the Ethiopian Military Installation but also the American-Run Electricity generator in the other side of town (WikiLeaks, 1975). There we’re two more demonstrations for Pro-Provisional Military Government in Addis Abeba that day. One was made out of war-veterans and the second one is in benefit of OAU, but both demonstrations was for the Ethiopian Unity. PMAC Haile Mariam Mengistu hold a speech in from of the veterans – where the main focus was to keep Eritrea as a region in Ethiopia (WikiLeaks, 1975). The PMG has announced to confiscate land from 7 former Ethiopian ambassadors this include Zewde Gebre Selassie, this is because of their rejecting to move back to Ethiopia. Zedwe has now been changed with Kifle Wodajo who now is the Ethiopian Ambassador to the US (WikiLeaks, 1975). On the 18th of July a three day delegation led by Louis Reyes, Cuban Ambassador to Iran and EPMG official has signed a joint communique for diplomatic relations. Reyes said: “the historic victory of the Ethiopian people can serve as an example to Africa and the rest of the World”. Maj Mengistu said: “there is a lot Ethiopia can benefit from your Cuban experience” (WikiLeaks, 1975). There is friction between Chairman Teferi Bante, First Vice-Chairman Haile Miriam Mengistu and Second Vice-Chairman Lt. Col Atafu Abate. The second echelon Viz. Major Sisay Habate and Lt. Col Asrate Desta (WikiLeaks, 1975). In the last year there been two major coup plots. The two main people against the government, first student development campaign from E.G. Major Kiros Alemayehu and the one in charge of media – Major Nadew Zekarias (WikiLeaks, 1975). The Derg has struggled with price-control and minerals exploration (financial restraint).The government has been civilian administrative structure down to Woreda(county level). The civilian cabinet has been stable. Below the ministers is now permanent secretary (department manager) and vice-ministers (the same as assistant secretaries). The government is still not consulting the technical experts before public policy statements. They have even announced without checking with Urban Land Reform. Future policy decisions are for rural land reform, nationalization of banks and insurance agencies etc. Also getting less technicians in government to get consensus (Wikipedia, 1975). 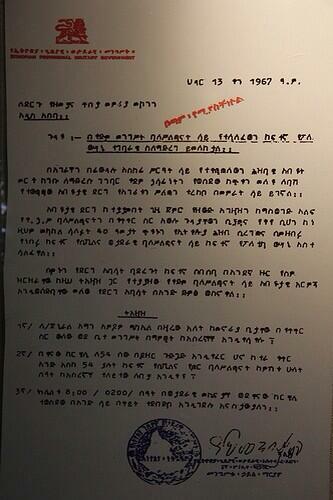 Addis has been tense the last three days after rumors of tension between Mengistu and Atenafu. This has threats to dissolve the military council and either both or one of them are arrested. The view the Derg shows the picture of unity to the public (WikiLeaks, 1975). PMAC First Vice-Chairman Major Haile Miriam Mengistu had his first national speech on both Ethiopian radio and TV. The main points of the speech was how the feudal system of both Menelik and Haile Selassie. The imperialist has used various techniques infiltrating the system with missionaries, teachers, merchants and entrepreneurs, government advisers and experts. 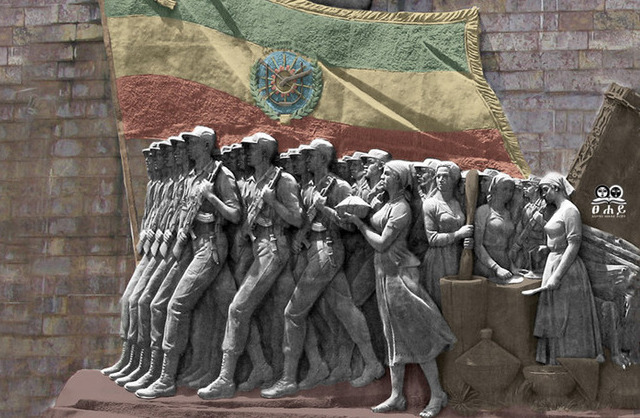 The Ethiopian Revolution have accomplished the deposition of former emperor, declaration of socialism, nationalization of means of production and distribution like rural land, urban land and extra houses. A new labor law and formation of Peasant association. Mengistu announced to the public that their scientifically working on making Ethiopia a People’s Democratic Republic. Addressed the Eritrean problem and called them out as exiled aristocrats and foreign imperialist, only reactionary bandits there. Mengistu also addressed people in the country side and progressive workers to form a United Front to work against Anti-Revolutionaries. Vice Chairman Mengistu has asked for continuing support for it, that authority from center to the provinces. Also still no recognition of the Eritrea which is a special case. The program is based on far-left militants and also on a Marxist model, and a Workers party is created, which is supreme and has to govern operation of the government. Also the focus on class struggles. Public sector is to becoming bigger and private farms will get more government support. Nationalization of both production and distribution with private incentives are enhanced. Veterans are now offered financial, educational and health benefits. Woman are mobilized for productive work and freed from limited roles that have been available for them. The Ethiopians problems will be tackled from the devolution from the center of main authority. The Eritrean problem is still not questioned in a special way, it’s seen as a provincial issue. The foreign policy of Ethiopia is remained unchanged (WikiLeaks, 1976). There been unauthorized demonstration that was followed by government warning against “progressive” that takes control over shops and private business. There been attempting of looting stores and shops near Addis Abeba, in Nazareth and Debra Zeit (WikiLeaks, 1976). Because of this Mengistu has promised free speech and freedom to demonstrate. This led to unreasonable behavior from the public that has threatened the public order. Mengistu himself has said their promoting: “raising revolutionary consciousness of the masses”. The hope is that the Ethiopian Easter weekend which is a family and religious affair which will lead to more calm and less tension – which will last over the weekend (WikiLeaks, 1976). Megistu has had a MediVac to China on the 20th May. What Haile Mariam Mengistu is expected to have it can either be gastritis which can lead to stomach cancer; he could have a brain tumor and also hurt after a gun wound. The unscheduled flight from Bole Airport went at night 22:00 – where it was reported to leave for China. Lt. Col. Atnafu returned to Addis Abeba from Gojjam (WikiLeaks, 1976). The Ethiopians sent messages of condolences to Wu The and Hua Kuo Feng. The leaders of the revolution are also being in the Chinese Embassy signing in the condolence book. The message from the leaders is setting Mao on the levels of Marx, Engels and Lenin (WikiLeaks, 1976). Eyewitnesses tell that there were automatic weapons firing that happened near a football Stadium at 2025 from two civilian automobiles. One was moving west from the revolutionary square. They fired both in the air until they turned south past fourth division headquarters. The followed by an explosion and another further down the road a few minutes later. A dozen store windows broken after the shooting. Following the incidence the EPMG put up a road block in the intersection surrounding the area. All vehicles and passengers are being searched. The roadblocks were taken away the day after (WikiLeaks, 1976). Heavy military control in Addis Abeba this morning after yesterday’s incidence. There has been big patrol activity after the attempted on Haile Miriam Mengistu the day before. Rumors have it that Mengistu has been injured in either leg or foot (WikiLeaks, 1976). Before the staged morning Workers-Rally there been an ambush on Haile Meriam Mengistu the 23th September. Which wounded him and this lead to Peasant Associations and urban dwellers to meet in the Revolution square in solidarity. It was a four hour event, which was hold tight by armed guards where the speakers spoke on the importance of keeping up the efforts of the revolution. Next troubled date for the PMC will be the 28th when schools reopen (WikiLeaks, 1976). CIA is supposed to be supporting Placards and EPRP. News broadcast is saying: “EPRP is Cia”(…)”Away with CIA agents, disguised as tourist”(…)”paid CIA agents”(…)”Yankees go home”(…)”No more chills and CIA” (WikiLeaks, 1976). Some rumors has been spread that it was a fake assassination attempt on Mengistu. This happening after the rally is to make him a hero. Also put restraints on the EPRP as a CIA front. There is issued more strikes. It will also be occurring more executions even though none of the would-be assassins. PMAC has gotten more support from the rallies and media this is from the peasants groups and workers. The reaction to it has put EPRP who has been seen as responsible for the attempt. Students might make trouble without the EPRP assistance. The violence of this last week might end up some calm this week (WikiLeaks, 1976). Izvestiya reports also that there was an assassination attempt on PMAC Haile Mariam Mengistu. Also, there was one important sign in one of the demonstrations in Addis: “bring CIA intrigues to an end” (WikiLeaks, 1976). At the conference it was a total of 7,000 or 8,000 peaceful Ethiopian attendance mid-afternoon rally to support and also show solidarity to Southern Africa. Chairman Ato Tesfaye Tadesse who introduced AAPS Second General Yousef El-Sabat, Iraqi Deputy Secretary-General of AASP Nouri Abdel Razzak, Secretary General of ANC Alfred Nzo, Crypriot Dr. Vasses Lyssarides, Soviet Pressidum member Figret Tabeev, Angolan representative Dr. Olga Lina, Vietnamese representative Tran Hoai-Nam, Cuban delegate Ramos Claudis, Yemen representative Anis Hassen Yahya, West German Committee of Anti-Imperialists solidarity delegate Peter Wal and Delegate of Western European Public Organization Conon Gor (WikiLeaks, 1977). Main rhetoric from the conference is against racism, imperialism, oppression, praising the Ethiopian socialist revolution and hospitality. We’re they also was supporting complete liberation of Southern Africa. The Vietnamese, Angolan, Cuban and the ANC did not mention the US during the conference. While other made references to the economic ties between Southern Africa and the US. The delegates from abroad are set to establish legitimacy for the PMAC and Mengistu (WikiLeaks, 1976). He will be interviewed by French and Swedish journalists and will be aired on French TV. One of the main questions was related to the Expulsion of U.S. Official Personnel last week. Mengstu has answered to that U.S. agencies whose activities has been terminated and were in Ethiopian on the basis of old agreements with Haile Selassie. The revolution is now clearing out the leftovers from the imperial era (WikiLeaks, 1977). Ethiopian-Vietnamese relations are strong, especially considering the wish from the Ethiopians of getting former U.S. Military equipment from the Vietnamese. There been secret visits from Ethiopian officials to Vietnam. There is not sure if the Vietnamese will support EPMG. A support with to the Ethiopians … they can complicate their relations with PRC and the US (WikiLeaks, 1977). Claude Cheysson from the EEC and was a part of a three person delegation to Addis Abeba the 18th -20th of May. PMAC Haile Mariam Mengistu signed a 30 million Birr aid accord during the visit. This aid accord was based for a rural water development project. This aid accord is part of the already with 280 million birr that will be available for the government of Ethiopia. The EEC program mission was completed in the June of 1976. Then there was put aside 100 million birr. The Amibara agriculture development project which has a aid accord accordingly to be set for a 35 million birr. The EEC follows the guidelines of determines which projects that gets funding. Foreign Affairs minister Col. Dr. Felleke Gedle-Ghorghis: “the government gives priority to rural development. Particularly agriculture, which employs vast majority of the Ethiopian people” (…)” Multi-purpose package programs which provides support to small holder farms through extension, livestock and range development projects”. The projects will be mostly into a agricultural sector, either development with infrastructure like rural roads. Also projects that are about industrial development which is focused on the output of agricultural produce. 10 percent of all the development is going to other then national development but for projects for regional projects. This kind of projects is the once that are on the Lake Rudolph and the Omo to develop tourism (WikiLeaks, 1977). (This was happing at the Jubilee Palace – Former palace of the Emperor Haile Selassie). Chairman Lt. Col. Haile Mariam Mengistu saying: “there will be no problem with regard to arms”. Further comments from the Soviet Union and that helped and “won high benefits” because of the Ethiopian revolution. Fear from “reactionary of neighboring areas”. Mengistu focused on the responsibilities to the motherland, secure national unity and also territorial integrity. He characterized American imperialism as an arch enemy and is now in league with reactionary Arab regimes. American imperialism he says: “by cutting its arms aid” (…)”now it’s time when we have to crush anti-revolutionary encirclement with unity and determination stronger then steel and hoist a new banner of victory at price of our blood”. On Djibouti want to forge a stronger relationship with: “neighboring reactionary forces” (…)”to withstand any and every step which might be contrary to national interests of Ethiopia in Djibouti” (WikiLeaks, 1977). 30th May 1977: Meeting with the Egyptian ambassador. The position of Ethiopia is that Mengistu is not strong, but if he can last until September, then he can be in a stronger position. PMAC Mengistu has to be effective with the use of the peasant army which is now in training. The peasant army will not be used in Bale-Ogaden region because of the Somali tribesman and the semi-desert where the army would be a disadvantage towards them. The result of the guerrilla war has hurt Ethiopian army and the Ethiopian situation in Bale-Ogaden has been bad for them. Some even describe it as a “bloodbath”. With this situation the civilian-military relationships in Addis could become tense. The Civilians might even use the peasant military army and Kebele Defense Forces to make a move against PMAC. Mengistu went on a two-day visit Libya after being in Moscow; this was to secure funding of Soviet War Material. This is to secure shipment of heavy weaponry from Libya to Ethiopia. Also a possibility for Cuban forces into Eritrea (WikiLeaks, 1977). The East German Politburo member Werner Lamberz together with a two Foreign Affair deputy minister Willerding, Foreign trade deputy minister Clausnitzer, Deputy Planning Commission Chairman Dieter Albrecht and several other SED-Central Committee members. They are on a visit as a delegation from the 13th to the 17th in Addis Abeba (WikiLeaks, 1977). This delegation has had lengthy discussion with PMAC Chairman Haile Mariam Mengistu and PMAC Second Gen. Capt. Fikre-Selassie Wogderess at both FONMIN and National Palace. Also the delegation went on a inspection tour of the Siga Meda military training (WikiLeaks, 1977). The Soviet Union has made a EPMG a priority and until this date, been spending great funds on the banking on it and hoping for solidarity, some free advice and also high levels visits. On the negative side the Ethiopian put up a front to the Somali Ambassador during the 15th July. This hasn’t served the Soviet Block interests, and can only lead to more polarization between the Soviet clients in the Horn (WikiLeaks, 1977). On the OAU African Refugees day on the 20th June Haile Mariam Mengistu called upon the OAU members to ratify OAU convention on African Refugees. At the same time he urged Ethiopian refugees to return home without fear of retribution. Mengistu noted that there is special cases and need efforts in Zimbabwe, Namibia and South Africa (WikiLeaks, 1977). There been movement from Somalia and Ethiopia. Eritrean youth, one identified as Kidane Kibrom has stayed in Hargeisa and El Garis Ethiopian Refugee Camps where has for the last 14 months. Kibrom claims 118 Ethiopians has had a hunger-strike in the camps for lack of jobs and training. UNHCR is claiming that the funds they have put for the camp is being used for other purposes then the camp (WikiLeaks, 1977). Mengistu on the settlement on the Middle East question is that Israel should be recognized, but also a quick withdrawal of forces from the Arab territories since 1967. Also added the Palestinian people have a right to a homeland, but must be a peaceful means in a peaceful settlement (WikiLeaks, 1977). Lt. Col Haile Mariam Mengistu was not interested in the interference from Somalia and Sudan on Ethiopian affairs. Mengistu was committed to “special committee” on the problems between Sudan and Ethiopia. This will solve the matter in a way Ethiopia sees fit. Like on the Eritrean question: the position they have is that Sudan wants to assure them independence. Mengistu met with 5 of 9 states in the committee to discredit by most OAU. Mengistu did say at the summit that there was a difference between Sudan and Somalia as problem makers. The Somalian view on rule of law is a total disgrace and has a long standing territorial claim. Where the Ethiopian issue with Sudan is more of a Sudanese leaders where they undermine the Ethiopian unity and territorial integrity (WikiLeaks, 1977). On the 14th of July there has been report of movements from the Ethiopian army. The reports are saying that the army has left the base of Tatek Meda Training base going to Eritrea and Ogaden. The number of army personnel is 83 bus loads of militia bound for Assab. EPMG is reported to reverse the actions in Northern Eritrea, but its most likely to be sent to Massawa. A small contingent of regular army has been sent to Asmara from Jimma in the Southwest Ethiopia. There are even reports of more army movements. The numbers of movement is 16 planeloads (some of them was aircrafts including some 720 BS), even militias are planned to be moved to Dire Dawa. Most of the bridges and highways to Dire Dawa are out of order. Therefore the trainload of 25 cars apparently left Addis Abeba but they will not come whole way directly to the destination of Dire Dawa. They have to hike the rest of the way when the rails are done (WikiLeaks, 1977). Mengistu called in the French Ambassador after seeing the ambassadors from east European countries in Addis Abeba. In this meeting with the eastern European ambassadors he told about the bad situation in Eritrea with the fall of cities of Keren and Decamere. He even complained about the aid the Soviets did not give to Ethiopia. Mengistu also claimed that Somalia Army Units has crossed over the border into the Ogaden. The French ambassador considered the war already had begun. The Romanian Ambassador added that Mengistu had said “Opposition-Controlled the territory including the Omo-Valley and the city of Beica 50 kilometers from the Sudanese border”. Mengistu also claimed that the Eritrean “liberation forces” has gained triple strength because of support from Sudan and Saudi Arabia (WikiLeaks, 1977). The issues that Djibouti has by the border to Ethiopia are making a lot of trouble. From Sudan has given a non-flight and also no overflight rights for any Ethiopian Registered Aircraft (WikiLeaks, 1977). Further PMC Lt. Col Haile Mariam Mengistu has received at Grand Palace Issa representative who has described the Somalia attacks as “calculated criminal act on the part of Mogadishu regime”. The Patriotic Media is telling victories stories of Ethiopian revolution and the continued call for voluntary contribution to the campaign (WikiLeaks, 1977). There seems to sabotage on the Addis Abeba to Djibouti railway. After the Somalian Mogadishu based government has sent infiltrators to blow up bridges along the railway. Though the Sudanese doesn’t seem eager to comply to Mengistu accusation of closing the airspace (WikiLeaks, 1977) . Issa representative comments: “acts of provocation for the consequence, of which Ethiopia should not be held responsible, reactionary regimes of Sudan and Somalia fully responsible for the deterioration of peace and security in Eastern Horn of Africa” (WikiLeaks, 1977). From the 25 of June 1977: the final stages of military training of the People’s Militia to fight against the Western-Somali Liberation Front. The Ethiopian People’s Militia fights for peace and stability on the African horn. On the 25th of June the military contribution gets a one-month salary over the one year campaign (WikiLeaks, 1977). PMAC Haile-Mariam Mengistu has from the 23th of July coordinated the Armed Forces and People’s Militia. The Headquarters are set in Harar for the fighting in Eastern Ethiopia and in the northern Ethiopia are located in Asmara. Because of this there was appointed 3 new Joint Commands and 4 new division commanders (WikiLeaks, 1977). PMC Haile Mariam Mengistu is not happy with the arms supply of Somalia which is seen as a foreign threat. Mengistu stated that the U.S. relationship had with previous government – described as a close cooperation in economic and defense. He had no intention of criticizing the US Government. US failure takes seriousness of Ethiopian security. In Emperors time with Sudan Government used Socialist arms from USSR and China to support secessionist movements in the North. Somalia was amassing arms from the USSR, they have 300 tanks. When Ethiopia asked for help from US Government they got empty handed. Ethiopian has reserved and has no actions towards US. What damaged Ethiopian image was the example of Spencer and Levine who helped Anti-Revolutionary feudalists to flee to Sudan and supplying them with American arms. Mengistu said that EPMG can no longer rely on US supplies. This is to protect independence and national integrity and will look elsewhere for arms. Ethiopia sees this to keep territorial integrity and fear of aggression from its neighbors that the US Government now supports (WikiLeaks, 1977). Former Ethiopian Foreign Minister Kifle Wodajo together with ex-minister Gedamu Tesfare thinks that the west is judging Soviets possibilities to settle the differences between Somalia and Ethiopia. What is important for Mengistu is the power and not Ethiopian nationalism, even with the growing pressure from the Soviet. Even the agents within the Revolutionary Council are partly open to give up parts of the Ogaden. Somalia claims to a larger area then only Ogaden. The set up will be to give the most of of the Ogaden. Kifle believes that the Soviet can on the contrary to the western believe that the war between Somalia and Ethiopian can be solved to Soviets advantages. Even the regimes terror tactics is silences the public (WikiLeaks, 1977). Moscow is seeking to save the Pro-Soviet regime of Lt.Col. Haile Meriam Mengistu from being overthrown or collapsing, especially with last military defeats like the ones in the Northern Province of Eritrea and the disputed region of Ogaden along with the Somalian border. There is a claim is that the Soviet has a deal in order for both Somalia and Ethiopia. This deal will give the most of Ogaden to the Somalia but the significant towns of Harrar and Dire Dawa gets to stay Ethiopian. There has been reaction on the issue from the Somalia President Mohamed Siad Barre. Instead it seems more like the Western Somalia Liberation is supported by the Somalian Government. On next Thursday there will be a special mediating committee of 10 African countries in Libreville, Gabon, where delegation from both Somalia and Ethiopia. Spokesman from Western Somalia Liberation Front says: “we do not expect any pressure and even if they do this, we will not accept it” (…)”out lands extends up to the Awash river and we are not going to compromise. We are going to take back all of our land” (…)”under no circumstances can we stop before taking Harrar and Dire Dawa” (…)”today that Somali territorial claims covered all of the Ethiopia’s four southeastern provinces of Bale, Sidamo, Arrusi and Harrarghe and are not limited to Ogaden region itself”. The disputed area of the Somalia and Ethiopia is 1/3 of the land mass Ethiopia and the equivalent of half of Somalia. The issue that Soviet has that they want to continue two have to Marxist states and not lose either. And with the nationalism in both countries it will be a feat to keep Mengistu in power when losing all that land. Ethiopia claims that Somalia has gone in will full-scale invasion from regular Somali Army Units. The Somalian Government denies this but says that the Front’s army is 30,000-man guerrilla. At the same time the goals and claims of territory from Somalia is the same from both government and the guerrillas (WikiLeaks, 1977). Chairman Lt. Col Mengistu said during a patriotic rally on 24th August. That Ethiopian revolution is supposed to bring equality, justice, democracy and a classless society. Mengistu was also addressing certain groups as masquerading as progressive but in reality is “anti-people” the groups is expected to be EPRP and EDU. Also he was direct on the Eritrean secessionist which he called aristocratic and ex-patriotic control over Eritrean production. External enemies are set to be Bare and Somalis (WikiLeaks, 1977). “It sad commentary that even USA which championed Ethiopia’s rights in 1935, has today betrayed its own cardinal principles, and reward aggression by refusing to deliver weapons bought by Ethiopia for it own defence. Such attitudes will only add fuel to the flame and disturb international peace and security. Indeed it is an unwise act from so great a height” (WikiLeaks, 1977). If the US Government wishes to have a normalized bilateral relationship with the Ethiopian government, then it has to become a link between two. Especially with Ethiopian sending a ambassador they intend to send to Washington (WikiLeaks, 1977). There have recently been small insurgencies from Somalia in Ogaden region. Ogaden region is in flames. Policies been announced on the 10th and 17th from the State Department Spokesman. The ambassador (the U.S.) is refraining from supplying arms to Somalia. Further on thinks the ambassador that the U.S. government should not take sides in this dispute between Ethiopia and Somalia. Berhanu Bayeh says that the immediate concern is that US Weapon and spare parts. The holdings of arms have been occurring during the last ten years. Because of that the people of Ogaden has suffered because of this. The Ethiopian Army has gone after the invaders, but has issues with having equipment. Now lacking the defensive arms that Ethiopian army gotten earlier from the US Government. Mengistu wasn’t in the way of ordering new shipments of arms. This was more honoring older contracts and sending both ammo and spare parts to the Ethiopian Army. Also, that the arms would be delivered and resumed immediately (WikiLeaks, 1977). There has been official Ethiopian Ambassador in Washington, USA. This is since 10. February 1975 (WikiLeaks, 1977). There been rotations and new appointments in the government there is 32 who are both civilian and military that are changing positions. This is three ministers, an Armed Force Chief, Air Force Commander and 16 Ambassador-designated (WikiLeaks, 1977). The Nigerian Federal Commissioner for Internal Affairs Alhaji Umaru Shinkafi was in Addis Abeba the 3rd October. The Nigerian President Gen Olusegun Obasanjo sent a special message to PMAC Haile Mariam Mengistu. In that message it was details on his mission to establish normal relations between Somalia and Ethiopia. Make sure that they follow the good progress for the meetings in Gabon in August and follow up these. Still with these negotiations happening there is still heavy fighting in the Ogaden. Ethiopia will like the Nigerian efforts both for Inter-African but also on an international perspective (WikiLeaks, 1977). Cuban Foreign Minister Malmierca is reporting that Mengistu will shortly take a trip to Cuba to meet Castro. This will escalate the presence of Cubans in Ethiopia and might make a difference in the friendship between the nations. This visit from Mengistu might not deliver any change to the relationship if the comments from US Policy Advisor Alfredo Ramirez Otero. 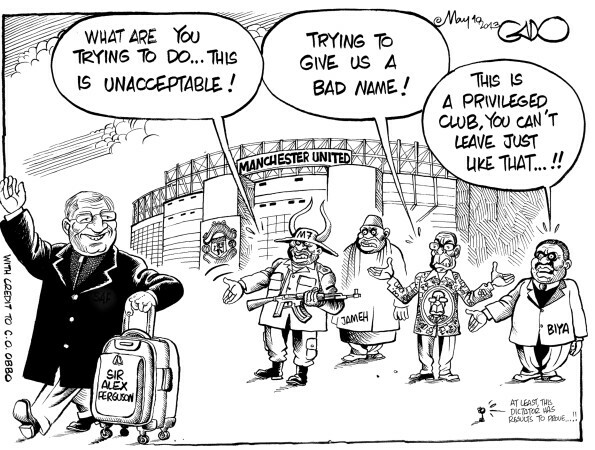 Even Castro doesn’t have a specialty for Africa in any way politicially. The Cubans has already a tiny presence in 300 “teachers”. There is a big possibility that the Cubans have forces fighting the Somalian for the Ethiopians. The Cubans want to have talks between the Government of Somalia and the Government of Ethiopia. It is accepted that the Soviet and Cubans have told Mengistu has to show moderation towards the US. The Cubans are opposing the struggle against the Ogaden and the Eritrean. Malmierca has said “that the Ethiopian and Somalian should get into some talks” (WikiLeaks, 1977). The Ethiopian Foreign Minister Felleke Gedle-Ghiogis will be in Sierra Leone for a OAU Ethio-Sudan Committee meeting (WikiLeaks, 1977). The Italian Communist Party has favored the Ethiopia over Somalia. Italian Communist leader Giancarlo Pajetta a MP in Italy has visited Ethiopia. The plan was made by Berlinguer and a Derg Representative. It was on the 60th Anniversary celebration in early November in Moscow. The Italian Communist Party has been unsure about the Ogaden war and the Ethiopian Revolution. The Italians have traditionally supported the Somalia’s and the road to Socialism and the alliance with Moscow. Because of the visit they now show their full support of Ethiopians. Pajetta feels the PMC Mengistu devotion to the world communist cause. The Italians has tried to get the Ethiopians to have talks with the Somalis. The Ethiopians will not discuss anything with them until the forces from Somalia are out of the territory. Pajetta had hope that the friendship with Ethiopia would open it up talks. The visit of Pajetta most important effect is that the PMC will have the Moscow support of EPMG and also support the Eritrean liberation force PLF. They want to give them autonomy from Addis. There have also been no words that Pajetta also went to Mogadishu (WikiLeaks, 1977). Haile Mariam Mengistu told two U.S. congressmen: “it is not our objective to cross our borders once we have thrown the Somalis out of Ethiopia. We intend to repeat the same mistake as the Somalis”. Mengistu stated further: “Policy of non-aligment” (…)”Peace, equality and social justice” (…)”A struggle is going on at every level between those who would like to see the old reinstituted and those who are determined to protect the revolution” (…)”intent and the objective of the revolution have been remain the restoration of Human Rights to the greatest majority of the Ethiopian people”. Representative Bonk from the congress is hoping for a peaceful solution in the Ogaden region, the Chairman of the PMC Mengistu said it wasn’t necessary to involve the OAU in the conflict (WikiLeaks, 1977). Said Barre went on a visit to Madagascar where he hold a speech at the international airport in Antananarivo where the message was “Other party (Ethiopia)” should also come to Madagascar. Barre said the talks with the Madagascar government officials where he said: “the great questions of today notably concerning eastern Africa, the Somali-Ethiopian conflict, Somali-Malagasy relation” (WikiLeaks, 1977). Hope this have given you some insights and been inspiring!